drnrn! « DON’T ROCK N ROLL NO! Published on November 18, 2007 in drnrn! and music. 2 Comments Tags: athens ga, lps, rocknroll, video. This is my new mp3 Blog. I often sit on the subway enjoying all of the music I get turned on to by all the various music blogs I like. 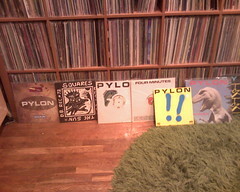 Digging in the record stacks a few weeks ago to help Kelly get excited about the Pylon reunion show got me to realize how long it’s been since I interacted with my LPs. Without a weekly dj gig, it’s easy to just let them sit there. I bought the reissued “Gyrate Plus” that DFA put out (get it on disc or in bits from other music), and while listening to it realized that “Stop it” was a call for me to start pushing out some of the old scratchy tracks that are languishing in my record shelves. So here it is. I’m starting slow, but hopefully I’ll post some really great stuff. None of it will be of very high quality, and I’m only posting songs to share stuff that I think is obscure, abandoned, inaccessible,in need of fans. Some of it may not even be music. This site will serve to promote these artists– I’ll post links to buy other releases, so please let me know what you think, and tell me how many when and where you pick things up.